The super lightweight cousin to the MD – our new Flagship long-distance spike features a super-light sole unit combining a lightweight Pebax resin plate, a Solyte® foam midsole and a minimal 4-pin spike plate. The flexible air-mesh upper wraps the foot while maintaining its support through selectively positioned internal reinforcements. 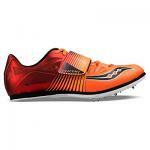 At 5.0 ounces the COSMORACER™ LD Track & Field spike won’t weigh you down. Comes with wrench and 6mm pyramid spikes. This product cannot be exported. ALLOW 3-4 EXTRA SHIPPING DAYS.